In my brief preview for the 20-20 match between Pakistan and Australia, I mentioned something about Umar Gul and Shahid Afridi. bowlers and will be worth their weight tonight." Little did I know how much weight the two would have on the outcome of the match. Gul and Afridi completely demolished the Australians. Initially it looked like Watson would take the game away from Pakistan, but Gul got him first ball. Afridi then just turned the whole match on its head with wickets of his first 2 deliveries. That too big wickets of Hopes, who had been in great form with the bat during the ODIs, and Symonds. When I said Gul and Afridi were very dangerous 20-20 bowlers, I was speaking from what I had seen from them in the past. They have always delivered in 20-20 cricket and both of them were the driving force behind Pakistan reaching the final of the 20-20 world cup in 2007. It is not a surprise that Gul and Afridi are the leading wicket takers in 20-20 Internationals. While I was working on the Dubai Sports City Magazine, which was distributed during the match tonight, I prepared a "Cricket Quiz". 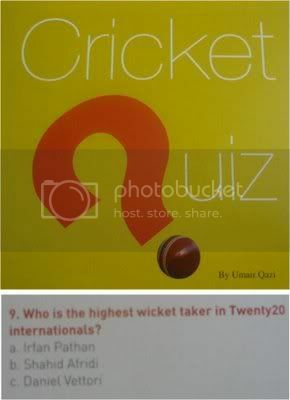 One of the questions that I included in the quiz was, "who is the highest wicket taker in 20-20 internationals?" The correct answer to that was Daniel Vettori. Little did I know that both Umar Gul and Shahid Afridi will overtake Vettori during tonight's match! 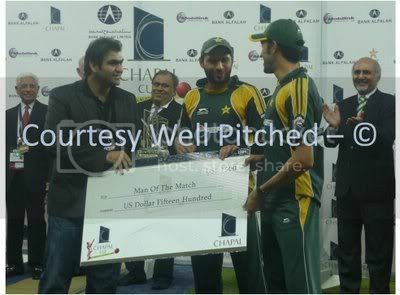 Collectively, Gul and Afridi had a part to play in 9 of the Australian wickets that fell - it was only apt then to give them a joint man of the match award for they truly were the men of the match. The men that destroyed Australia. LIB, a regular reader of Well Pitched who was there at the match today as well, pointed me towards the match bulletin on cricinfo by Sidharth Monga. Monga says: "Australia had fielded almost a second XI, and played like that." Now now Monga, I suggest checking the facts before claiming that. 9 of the Australians that fielded today are a part of Australia's 20-20 World Cup squad. Plus atleast another, in Callum Ferguson, should have been a part of that squad; many Australians will agree with me on this. Not only that, but atleast 7 of them are sure shot starters in any 20-20 match that Australia plays. That Monga, does not make a 2nd XI. Had the result been any different if Ponting, Clarke, Mike Hussey, and Mitchell Johnson been playing? Umar Gul and Shahid Afridi would have still devoured them! Funny thing about the quiz question. It's oddly coincidental. But yeah, nice win. We really showed everyone [how to lose]. All that success is looking so much more imminent. will pak play more t20 matches b4 t20 wc...? I am not sure abt how correct the information is but i had read somwhere that apart from a few practice games that pak will play against the local counties, they will take on SA on the 1st of June and India on the 3rd before officially launching there campaign against England on the 7th! I have a feeling the subcontinent teams will do really well in this T20 World Cup. India will do well because of the experience from IPL. Sri Lankan cricketers will do well as all of them are in form especially Malinga, Dilshan, Sangakarra etc and you can never count Pakistan out of anything. They have some super talented players who are tailor made for T20. Also of course with all that is happening with Pakistan Cricket, I think the players will be really keen on a good show at the World Cup. SP: As LIB points out, those are the practice games that Pakistan will play in England b4 the T20 WC starts on the 5th.. prior to that they have some practice matches lined up in Pakistan..
Rayden - I agree with you.. India and Pak should start as favorites given their performance in 2007WC.. and their overall T20 record.. I believe Pakistan has lost only 3 out of the 17 T20 International they have played. India are the champs. Lanka had a bad campaign in 07, lets c what they can do this time round. Though I am wary of Netherlands and Dirk Nannes who are grouped with Pakistan! Normally Netherlands even with Dirk Nannes should not have been a problem for Pakistan. But one thing I have learnt over the years is you cannot trust the cricket teams of both Pakistan and India. On any given day they could lose to a club side as well. I will never forget India and Pak crashing out of the 2007 world cup courtery of Bangladesh and Ireland. Rayden: I agree.. there's a reason why Pakistan has the unpredictable tag on them..
India on the other hand have been more consistent lately..
bro i agree the fact that aus players made in to the squad. but they ddnt field johnson,ponting ,hussey who will definitely make in to their playing 11. 3 is not a small number. so aus definitely fielded a low key squad. may be to hide their asli trick before the t20 world cup. let us not forget warner as well. any how good job dude. Chullanz: welcome to well pitched.